"Face The Funk" would like to thank everyone that came out and celebrated the life of Prince with us on his birthday June 7, at the Brooklyn Bowl in Las Vegas. We had the pleasure of playing his after party a couple years back, and he is a true artist that will be severely missed by us all! We shall continure to Face the Funk... Somebody's Gotta Do It! "Somebody's Gotta Do It!" has officially been released! A labor of love and a healthy injection of funk and positivity, this second album from Face the Funk is ready for your album collection! LISTEN AND ORDER HERE! "Face The Funk" has been tapped to perform on Princes birthday, June 7, at the Brooklyn Bowl in Las Vegas! We have some special arrangements planned that the Purple one himself has done live - as well as selection from our upcoming album! The new album has a name: "Somebody's Gotta Do It!" Coming Soon!! "Face The Funk" second album is in the works being written and recorded by Frank in his studio, featuring members of the group and a few special guests - stay tuned, it's gonna be extra funky! You can also keep up to date with the project on Face the Funk's official facebook page! "Face The Funk" had a great and well recieved show at Vinyl inside the Hard Rock Hotel, in Las Vegas. There is a second CD underway being recorded as we speak and tentatively on tap for possible release in late 2015! Stay tuned for more info on that! In the meantime, if you haven't already picked up your copy of the first album, you can get it HERE! Be sure to like Face the Funk's official facebook page! You can also listen & purchase Face the Funk's past album HERE! "Face The Funk" will be returning to perform on Dec 30th 10:00pm, at Vinyl inside the Hard Rock Hotel, Las Vegas! Face The Funk's debut album "Here At Last," draws from old-school funk influences, while presenting new cleverly written material. Have a listen, and pick up your copy today! Word is that Face The Funk is also working on a new album - so stay tuned for news on that! Face The Funk is proud to announce his newly redesigned www.FaceTheFunk.com. The band wishes to thank and acknowledge the web designer, Aidin Ashoori, for all of his talent and hard work. April 16, 2013 - Face The Funk live debut! Frequency Entertainment presents the debut of Vegas' hottest new funk act "Face The Funk" - April 26th 10:30pm at Vinyl inside the Hard Rock Hotel, Las Vegas. "Face The Funk" is the brain child of award winning composer, Frank Klepacki, who's love of old school funk music is reflected and based on the edgier founding influential bands of the genre. Comprised of an all-star line up featuring musicians who have toured with such names as The Family Stone, Gladys Knight, and Celine Dion, this band packs a serious groove. "After watching the Woodstock film performance of Sly & The Family Stone as a kid, I said to myself, 'that's what I want to accomplish someday,'" says Klepacki. "Since then, I was then fortunate to have the opportunity to tour with The Family Stone as their drummer for 3 years." Face The Funk's debut album "Here At Last," draws from old-school funk influences, while presenting new cleverly written material. "I've been inspired by so many great funk artists and musician friends who share in the love of this music, and because there are so few new artists doing this, I've pieced together an album and band to help re-introduce this music to the modern generation." The Review Journal quote on Face The Funk: "With a get-up-out-of-your-seat horn section, touches of wah-wah guitar, plenty of badass, booty-moving bass lines and trilling keys, this is a hard- funk sweat bath!" Have a listen, and pick up your copy today! PRESS RELEASE: FACE THE FUNK: HERE AT LAST, NOW AVAILABLE!! "Face The Funk" is the brain child project of Frank Klepacki, who's love of old school funk music is clearly reflected in it's debut release, "Here At Last." "I began my funk journey at the age of 12 when I watched the concert film 'Woodstock' and discovered the captivating performance of Sly & The Family Stone" says Frank. "I said to myself, 'that's what I want to accomplish someday,' and since then, though my path has been a musical journey through all genres, I was fortunate enough to have the opportunity to tour with The Family Stone as their drummer for 3 years." "Here At Last" contains all of Franks major funk influences wrapped up in a single package of all newly written material, in an effort to keep the sound of old school funk alive, and is dedicated to all the founding influential bands of the genre. "I've been inspired by so many great funk artists and musician friends who share in the love of this music, that I've pieced together an album that I feel is a good representation of everything I love about it. Funk music in this form is a rare breed these days, so I wanted to contribute a new reminder to how positive and groovin' this great genre is." While Frank writes, produces, sings and performs most instruments, The album also features some of Las Vegas' finest musicians, including horn section The Fat City Horns, and special guest appearances by guitarist Nate Wingfield, bassist Walter Jones, and singer Princetta Saray. 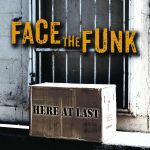 "Face The Funk - Here At Last" is available at www.facethefunk.com, Itunes, Amazon, CDbaby, and most other digital retailers. Order a CD or digital copy HERE! !